Jow Koon Noh was born on Saturday, 5th Febuary BE2440. He was the eldest in the family of 5 siblings. Jow Koon Noh was the first batch of students at then Official University of Kingdom Siam, now known as Julahlonggron University. After completed his studies, Jow Koon Noh became an officer in the King's Palace, then ruled by the 6th King of Thailand. He was the closest attendant to the King, where he moved to the King's chamber and attended to the King's daily needs. After the death of the 6th King, Jow Koon Noh was very sad. He left the palace in BE2468. Jow Koon Noh's parents wanted him to get married with a lady teacher after seeing Jow Koon Noh so sad over the death of the King. However, before anything could be firmed up, Jow Koon Noh told his parents that he wanted to be ordained. Jow Koon Noh ordained on 23th March BE2468at Wat Tepsirintahwaht, a day before the 6th King was cremated. He became a monk as tum boon for the 6th King. Jow Koon Noh never planned to leave the monkhood, from one rain retreat to second rain retreat, third and fourth until he passed away on Friday 8th January BE2514, in total he went through 46 rain retreats. He was ordained by Somdej Pra Putpohsahjahn, and was his preceptor. 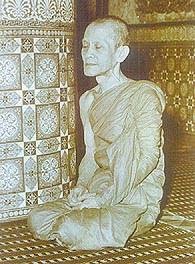 Pra Putwiriyaaigon, the abbot of Wat Sommanatwihahn and Pra Udon Seelahkon Wat Tepsirin were the dhamma teachers. After Jow Koon Noh ordained, there are visitors to the temple each day. Some came to ask for fortune-telling, some came to ask for help to solve problems and some came to present offerings to him. Jow Koon Noh never accepted any gifts or offerings, and always told them to give them to other monks. This is because Tahn Jow Koon Noh observed the 227 precepts strictly. Some lay devotees were not happy that Tahn Jow Koon Noh did not accept their offerings and their attendance, they went to complain to the Jow Koon Noh's preceptor. Somdej Pra Putpohsahjahn reprimanded Tahn Jow Koon Noh for not accepting the audience of the lay devotees and their offerings. Tahn Jow Koon Noh explained that he ordained as a monk for the purposes of tum boon for the 6th King and also to study the teachings of Buddha. He said he has yet to understand the teachings and he required to concentrate on his practices. The people who came to the temple, came with their problems from outside world, since has ordained, he wanted to cut the attachments from the outside world and would not want to meddle or involved. After Pra Somdej Putpohsahjahn listened to Tahn Jow Koon Noh's reasons, he stopped reprimand and accepted his decision. Although Tahn Jow Koon Noh has passed away, but the things that he left behind still provide protection and blessings. Everytime Tahn Jow Koon chanted his amulets, there seemed to have some incidents happened such as, when on Saow Hah, 22th March BE2512, a reporter took a picture during the chanting of amulets by Tahn Jow Koon Noh, the picture turned out showing bright lights emerged from Tahn Jow Koon Noh's brush when he sprinkled water from the brush. This had happened many times during the chanting of amulets. This is the power from Tahn Jow Koon Noh, his chanting confirmed to be effacious. Tahn Jow Koon also has the ability to read the future. He knew what could happened in the near future. Many at first do not believe him, but after the incidents happened according to his predictions, people were amazed.